I previously introduced you to Rudy and Fanny, my New York City friends’ new kittens, after I met them for the first time in August. I fell in love with both of them at first sight. And yes, I’ve come clean about this to Allegra and Ruby, and they grudgingly accept that they now have New York cousins. When my friends planned to go away for a few days in November, they realized that their trusted cat sitter would not be available. And they didn’t really know anyone else they’d completely trust with Rudy, Fanny and 16-year-old Squirty, so they asked me whether I’d be willing to stay at their apartment for a few days and take care of the kids. 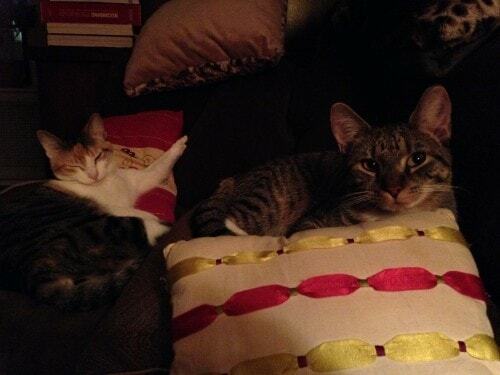 An all expenses paid trip to New York, and I would get to hang with my feline “niece and nephew?” Yes, please! Allegra and Ruby were not thrilled, but they’ve since forgiven me. I had a wonderful time. I spent most of my time hanging out with the kids, but I did get some sightseeing in, too. Central Park, one of my favorite places in the city, was just past peak fall color, but was still stunningly beautiful. One of the days I was up there, one of my oldest friends (we went to high school together!) came into the city from Connecticut, and we toured One World Trade Center. 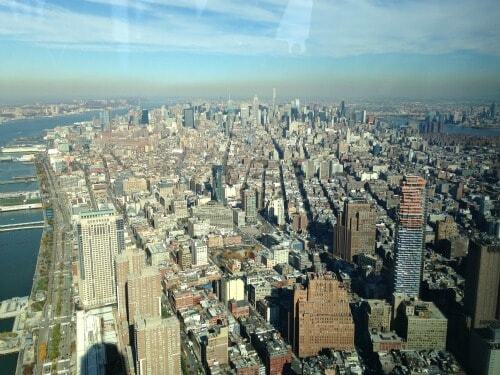 It was a clear, beautiful day, and you truly could see forever from the One World Observatory on the 102nd floor. Despite the stunning views, it was impossible not to think of the people jumping from that height on 9/11. I hadn’t been to Lower Manhattan since 2002, a few months after the attacks. It did my heart good to see how this part of the city has come back to life since then. Since we were already in Lower Manhattan, we took a short cab ride to Soho, where we visited Meow Parlour, New York’s first cat café. I’ll write a full report about my visit soon. But the best part about my visit was hanging out with the kids. I had been thinking about going to a Broadway show, but decided to stay home both nights instead. We played, watched TV, and read. 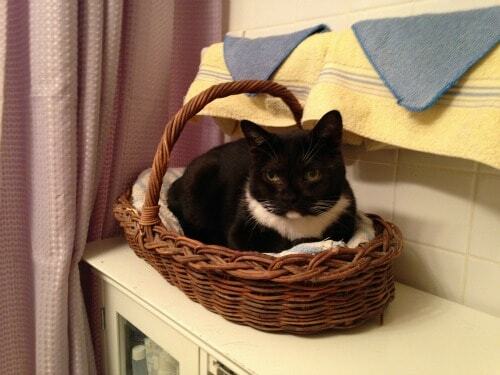 Squirty preferred to spend most of the time in his favorite basket on the bathroom cabinet, but Rudy and Fanny stuck close. I know they missed their mom and dad, but I think they considered me an acceptable second choice. I loved being able to pretend that I lived in my favorite city, even if it was only for three days, and while I was, of course, happy to come home to Allegra and Ruby, I hope the planets align again some day, and my friends will need to leave town and their regular cat sitter won’t be available. I live an hour by LIRR from NYC and do not take advantage of that short trip often enough! Your friends were fortunate to have you to kitty sit. It really was a major problem when my sitter moved to Florida. I did finally find a trustworthy replacement and I was thrilled! I can now enjoy a vacation again! Hope you get to do it again soon. what great friends! I’ll ship my brood to you so I can have a vay-k. I love that you have turned into such a total cat person, Will! And I won’t take full responsibility. I think Anya and Oscar have a little something to do with it, too! Ingrid, that sounds like a wonderful getaway, full of the comforts of a cat-filled home and the adventure of exploring the Big Apple. Thanks for sharing your story and pictures with us. Here’s to wishing you (and me) the opportunity for another such cat-sitting gig sometime soon. Sounds like a fun trip. Thanks for sharing. This sounds like a purr-fect trip. Thanks for sharing your adventures with us. My dream job (if you can call it that) would be a cat sitter. I’m glad the girls forgave you. Looks like you had a wonderful time. Especially cat sitting. Those are darling cats! Must tell us more on the cat cafe. Wish there were more than a few cafes, around the country. 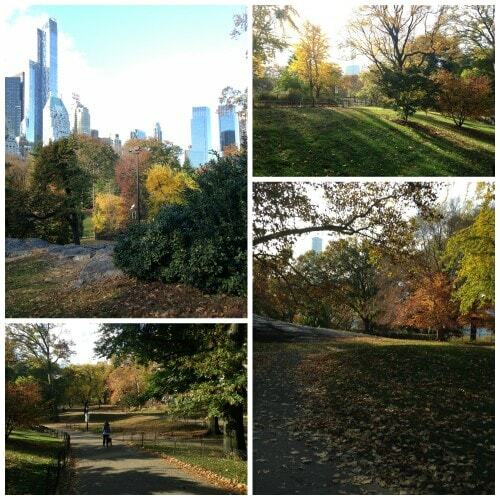 Central Park looks beautiful in the fall! It sounds like a lovely time. Sorta an air B&B with kitty comforts. And lucky for your friends, leaving your fur babies with a trusted friend allows them to enjoy themselves too! 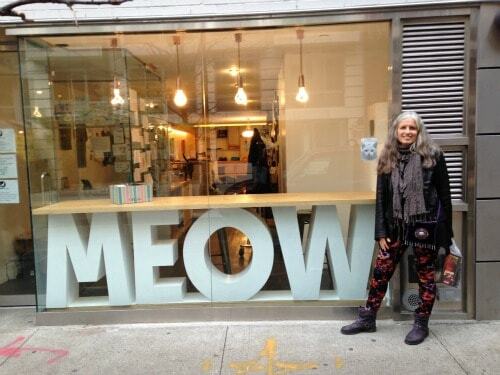 Great post Ingrid, I’m off to New York for a special birthday next May and Meow Parlour is on my list! I’ll look forward to hearing how it compares to Lady Dinah’s Cat Emporium, Rachel. My human loves New York and is totally envious! What an awesome way to get to stay there for a few days. I myself travel a lot and thankfully my house-keeper does the “Cat Baby sitting”.Cat ownership is expensive and non pet lovers think that some cat or pet owners are crazy to spend a fortune on their cats while the same could be spent on human welfare , etc.I myself would love the job of a “Pet baby sitter” with free paid vacation .